Home Sweet Haselton: If it isn't broke, don't fix it. There seems to be a trend of companies updating 80s cartoon classics into hip versions suited for today's kids. To that I ask, why is it needed, and secondly, are they not creative enough to develop new ones? I am sure it boils down to marketing. 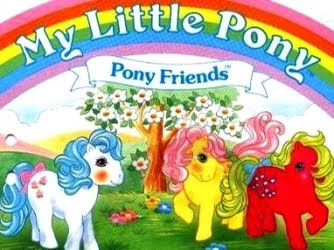 Those who loved Rainbow Brite, Strawberry Shortcake, and My Little Pony are likely approaching the age to having kids of their own and perhaps likely to bring the retro products home. I, however, balk at the idea of these "upgraded" doppelgangers. It's the OG for me, or nothing. 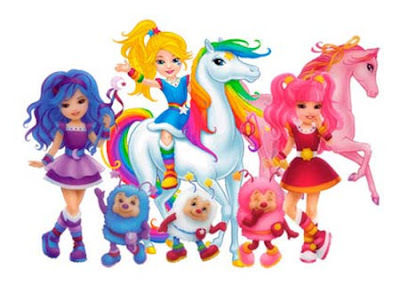 Who couldn't love Rainbow Brite, the Color Kids, and their Sprites?!? WTF. Why does she look like a warped version of Sailor Moon and aged about 10 years?? Those lovable horses! 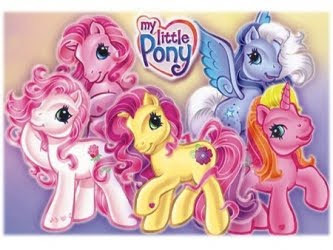 I'll never forget my stable full of scented, bejeweled, winged, and even one Easter Bunny-gifted seahorse. Those eyes are staring me down like the creepy Bratz dolls. These are no Cherries Jubilee Mom! Such a loveable little girl! Her friends had the best names: Huckleberry Pie, Plum Puddin, Apple Dumplin, and T.N. Honey. And the foe: Peculiar Purple Pie Man, naturally. Strawberry Shortcake actually debuted as a line of American Greetings cards and saw makeovers in 2002 and 2006. Though she is not the Shortcake of my youth, at least there is a sliver of a girl in the caricature. And some people still believe nothing good came out of the 80s. Just add these to the list that includes Ronald Reagan, Pat Benatar, "Jessie's Girl," and of course, my friends and husband.